The Herald adds value; but is it real? The Sydney Morning Herald uses the first few pages of today’s edition to announce AirLink – a way of linking to additional information from the paper using photographs. So you download the latest SMH app from the App Store. 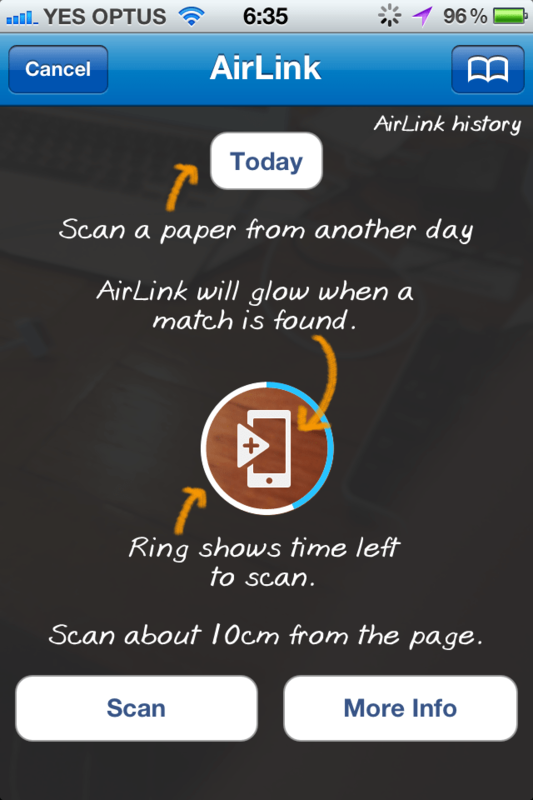 Find a photo in the paper marked with the AirLink logo and fire up AirLink from within the SMH app. Point your iPhone’s camera at the photo and it will recognise what you are looking at and pull in additional information such as videos or pictures. From a technical point of view this is presumably using a picture-recognition facility similar to, or the same as, that used by augmented reality programs such as Aurasma. The clever bit is the fuzzy recognition of the picture rather than using a more explicit link like a QR-code. I quite like the idea here. In theory you don’t need to print anything explicit on the page, all the work is done electronically. The page can be designed simply for best presentation rather than to include links. Of course they will need to print the AirLink logo all over the place to indicate which photos it will work with: But that’s one static logo, which I guess will shrink in size over time as people become used to seeing it. The process appears to work quite well, although it is a bit unforgiving if you don’t get yourself aimed at the picture correctly. One of the pictures I tried it on required you to frame just a bit of a larger picture. I failed to do it correctly several times and each time had to start from scratch rather than just re-framing the bit required for AirLink. Not a big deal, but lacking a bit of polish. The real test here though will not be the technology, which is pretty much well-tested in other applications. The test is whether the SMH editors can use the technology to add real value to the newspaper experience. Once the initial thrill of using the technology because it is new has worn off, it will entirely come down to AirLink leading to worthwhile content. Note if you are downloading the app, AirLink is a pretty popular name. You actually want the SMH app which, sadly, gets pretty badly reviewed in the iTunes Store.